Firstly, what are yin and yang? 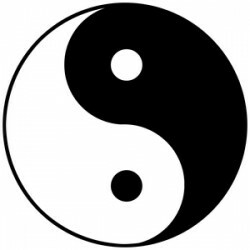 In Chinese philosophy (and traditional Chinese medicine), yin and yang are symbols which are used to describe how seemingly opposite forces may actually be complementary, interconnected and interdependent in the natural world. This concept was developed by observing the environment. ‘Yin’ originally referred to the shady side of a slope, while ‘yang’ referred to the sunny side. Later this concept was applied to other things in nature which occurred in pairs and had complementary, opposing characteristics, such as day and night, water and fire, light and dark, active and passive, etc. Yang is said to have more energetic, functional qualities and can be associated with heat, brightness, expansion and movement, while yin is associated with physical form and stillness, cold and darkness – like the shady side of the mountain. The yin/yang symbol is widely used and demonstrates another aspect of this concept, that nothing is all yin or all yang, or put another way, nothing is all black or all white. The black has a little bit of white, and the white has a little bit of black. Yin Yoga is therefore a wonderful complement to any Yang style of exercise. Long holds of yoga poses also offer us the opportunity to turn inwards and to meet our present moment experience.